So GMN is back! 🙂 As you can see, we moved away from GuideXML and moved to the 2013 era. You can also subscribe to this blog using the form on your left. If you are interested in contributing, have a look at the end of this newsletter. RAP is an abbreviation for “Rap Ain’t Prefix”. It is a variant of Gentoo Prefix that uses its own libc instead of that of the host. By depending only on the Kernel, it expands the horizon of Gentoo Prefix into the systems as handhold Android, multiarch Debian/Ubuntu and ancient (5 years+) GNU/Linux with a libc lacking crucial modern features like fortify. It eases the maintenance of Prefix by being more identical to Gentoo vanilla. Although the Prefix team has been keeping the possibility in mind and have made several unsuccessful attempts earlier, it was Ruud (redlizard) Koolen (now a Gentoo developer) who brought the first implementation into reality. Benda (heroxbd) Xu from the Prefix team joined the effort of RAP for his Gentoo on Android project under Google Summer of Code 2013, mentored by Luca (lu_zero) Barbato. RAP specification has been tracked by a GLEP draft. The draft is endorsed by the council and will be further refined after recovery of the GLEP process. Contact the RAP developers by mailing list gentoo-alt@lists.gentoo.org or IRC #gentoo-prefix on freenode for further information. Pavlos Ratis and Michal Gorny (under the mentorship of Theo Chatzimichos and the great help of Robin Johnson and Matt Summers) were both working on our upcoming identity.gentoo.org website. It is going to be our LDAP frontend, which will be connected with various Gentoo services as well (eg Overlays, Git repositories and Planet). Additionally, it will act as an OpenID provider, which will allow us to connect it to our various Gentoo websites, and use only one account for all of them. Pavlos has been working on the LDAP part. He implemented the login, signup, attribute settings and password recovery pages, all of the above working against a clone of our production Gentoo LDAP configuration. For the future, privileged accounts through groups are planned as well. Read his final report. Michal has been working on the OpenID provider, as well to two factor authentication. The website supports authentication with SSH, SSL certs and OTP tokens on top of the traditional username/password authentication. Read his final report. The team gave much weight on unit and integration tests as well, having around 80% coverage so far. Acceptance tests with selenium are also planned. Also, a large number of work has been done on upstream libraries, like django-ldapdb, django-auth-ldap, even a patch in Django itself was submitted. The plan for the near future is to finish the groups support first, and then deploy a testing instance for developers’ only. Around February of 2014 the website should be hopefully ready for production usage, although it will remain a developer-only service for quite some time. In case you are interested in helping, the code is in Github, and you can contact the team in the mail identity@gentoo.org, or in the IRC channel #gentoo-www in Freenode. The Puppet Portage module provides various Gentoo related features. While it used to be tight to Portage only, Vikraman Choudhury (under the mentorship of Adrien Thebo and Theo Chatzimichos) added support for a number of other Gentoo tools, like layman, eselect, webapp-config, and additionally he did tons of bugfixing. The features are going to be released soon in version 2.1.0 in the PuppetLabs Forge. Sven Vermeulen, a Gentoo Hardened and Documentation developer, has made his first book publication: SELinux System Administration. “The book first starts with the fundamentals of SELinux – concepts you really need to grasp before diving into SELinux. Then, it goes on about switching SELinux state (disabling, permissive, granular permissive, etc. ), logging, managing SELinux users and roles, handling process domains, etc.” is how Sven summarizes his book. 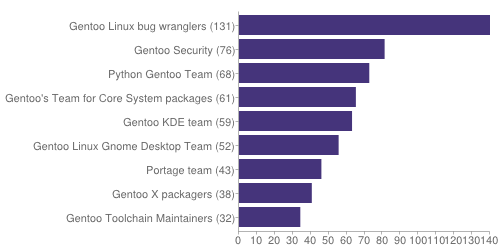 Do you want to know more about SELinux on Gentoo? Read the excellent wiki page. The October 2013 council meeting was comparatively uneventful. Completely replacing the current Gentoo Code of Conduct with a new text did not find a majority; instead a decision about more gradual incorporation of improvements was deferred to the next meeting. As a consequence of the decisions taken during the September 2013 council meetings, the m68k, s390, and sh profiles have in the meantime been modified to automatically accept testing/unstable keywords. Stable keywords of these arches can and will now be replaced by unstable/testing keywords in ebuilds. initramfs will not be supported starting on 01-Nov-2013, and all users with such setups are encouraged to migrate to an initramfs. LinuxDays is an annual Linux conference that takes place in Czech Technical University in Prague. This conference has big value for our community, as last year it was co-hosted with the Gentoo Miniconf. The conference was a big success this year, having around 500 visitors. Many presentations and workshops took place, the highlight being the 3D printer workshop. Gentoo was also there with a booth, organized by the Czech Gentoo Developers and Contributors, many of whom had presentations around various topics (Autotools, Puppet etc.). 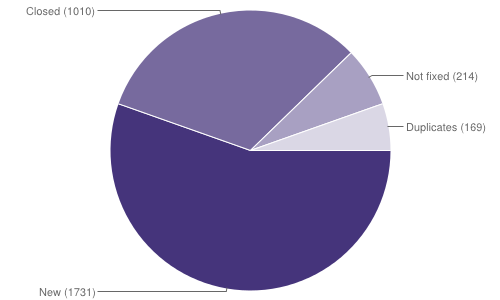 Gentoo is made up of 247 active developers, of which 36 are currently away. 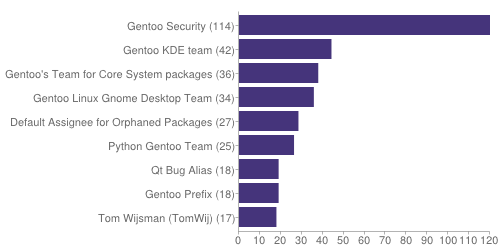 Gentoo has recruited a total of 788 developers since its inception. Mikle Kolyada joined the PPC64 and MIPS teams. Mark Wright joined the Emacs team. Ian Delaney joined the Openstack team. Kacper Kowalik left the desktop-wm herd. Markos Chandras left the Qt team. Pavlos Ratis joined Overlays and Planet team. Rajiv Aaron Manglani left the voip herd. Lars Wendler joined the base-system herd. Hanno Böck left the sci-geosciences herd. Jorge Manuel BS Vicetto joined the Infra team. Jason Donenfeld joined the Infra team. Pavel Kazakov has joined the LXDE team. (announcement). Ruud Koolen has joined the Prefix team. (announcement). LeaseWeb provided us a new box. have decent Gentoo support. If you are interested in helping, contact Theo. The following tables and charts summarize the activity on Bugzilla between 30 September 2013 and 31 October 2013. Not fixed means bugs that were resolved as NEEDINFO, WONTFIX, CANTFIX, INVALID or UPSTREAM. Did you know you can switch the locale of your Gentoo box using the locale eselect module?